Super tasty snack thats high in protein and satisfies while following the PiYo Eating Plan! Combine the first two ingredients, adding liquid (almond milk) to create desired consistency. Place in the freezer for 10-15 minutes, depending on comsistency you prefer. 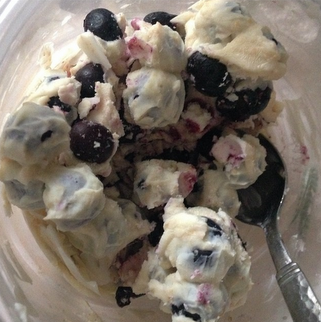 This entry was posted in PiYo and tagged absaremadeinthekitchen, blueberries, eat, eating, eatright, fit, fitspo, food, frozenyogurt, getfit, gethealthy, greekyogurt, healrhy, health, inspiration, macros, motivation, muscle, pilates, piyo, protein, proteinpowder, proyo, recipe, recipes, results, Snack, strength, strong, workout, yoga, yogurt on July 8, 2014 by AngelinaFitness.